I’ve always been a huge fan of Tom’s of Maine personal care products since they carry a range of natural products. A lot of their products are vegan, kosher, halal certified, and gluten-free as well and the packaging for all their products is recyclable. Today, I will be sharing you guys my thoughts on their long-lasting natural deodorants, which contains no aluminum, petrochemicals, parabens, artificial fragrances or preservatives. It’s clinically proven to have 24-hour odor protection and the deodorant’s ingredients are derived from nature. They carry a range of scents: Lavender, Apricot, Tea Tree, Lemongrass, Natural Powder, and many other natural scents. Personally, Apricot is my favorite scent out of all of them because it reminds me of honey peach green tea that I used to get at a boba shop. 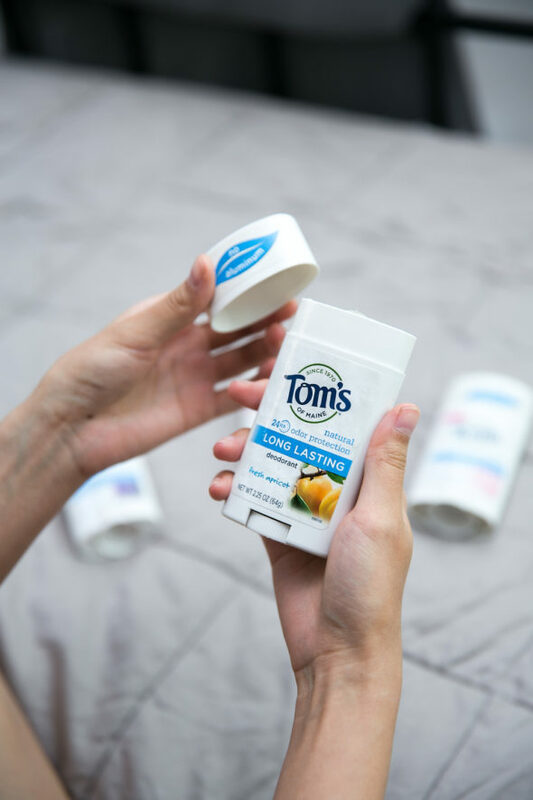 I made the switch from a conventional antiperspirant to Tom’s of Maine natural deodorant since I’ve been trying to replace a lot of my personal care with natural products that are better for my body. Some conventional products contain ingredients I want to avoid or don’t want on my body so I try to evaluate the ingredients of the personal care products I use to maintain a healthy lifestyle. I try to take care of my body by evaluating the ingredients of personal care products I use to maintain a healthy lifestyle. Keep in mind that natural deodorants like this one from Tom’s of Maine are not an antiperspirant and don’t provide the same wetness protection as antiperspirants. Antiperspirants are intended to reduce perspiration and per FDA guidelines, must include a form of aluminum as an active ingredient. So if you are switching from a conventional antiperspirant to a natural deodorant, it will take some time for your body chemistry to adjust to it. Since I don’t perspire easily, I didn’t have an issue with the level of wetness protection of Tom’s of Maine natural deodorant but that is something to consider for those of you that perspire a lot. I love using my Apricot natural deodorant on days when I will be heading to the gym. It really helps ensure my underarm stay dry and I feel better knowing that I’m making a healthier choice. For those of you interested in knowing more about Tom’s of Maine natural deodorant, click here for more info. So glad I read this. I didn’t know they didn’t have the same level of wetness protection. I don’t sweat easily either but it’s good to know for when you’re really active. Oh, I like that the ingredients in this deodorant are more natural! Thank you so much for sharing such an honest review, love! <3 Can't wait to try it! I haven’t really used this product! But I would love to! Thanks for such a great review! Hope you are having a great weekend! i’ve never tried natural deodorants before. But it sound really cool! I have not tried any natural deodorants yet. But I would love to. These products seem amazing and a great alternative to usual deodorants. Ugh, yes! Toms is great. PS: You look so beautiful, love your hair!